Added various new texts to support the updated SCMR and Cinematic mods. Added all new SCR story-interludes which appear as in-game videos before certain mission briefings. Added two bonus SC2-version cinematics, 1 appearing at the end of Terran09B (only the city tileset version) and 1 appearing at the end of the Enslavers Redux Epilogue03. Added all new Starcraft: Remastered (SCR) high quality Terran/Zerg/Protoss briefing images, briefing animations, victory screens, defeat screens, and loading screens. Added the ability to show the new "story" SCR interludes, found prior to briefings in certain missions. By default this feature is turned on but can be disabled in the SCMR Launcher and reverted to the original "black" screen with plain text instead, as found in original Starcraft. Added a new single player difficulty to choose from in campaigns; Brutal. As with other difficulties, this can be toggled via the Launcher or on a per-map basis during briefings. Be wary; brutal difficulty is not for the faint of heart! Enemy attack waves will be relentless against you as well as having to contend with periodic enemy spawns from off-map in search of your complete destruction. Only seasoned veteran Starcraft 2 players are encouraged to attempt this new challenging level of difficulty! All building, weapon and ability sounds will now use their Brood War versions by default. In order to revert to standard SC2 versions, these can be toggled in the SCMR Launcher under the "Gameplay" menu. Fixed some classic voiceover's for units not applying when checked in the SCMR Launcher under "Voices" section in the options menu. A new option called "Static Briefings" is available in the "Interface" menu. This creates a small static distortion to unit portraits during briefings, to mirror the effect as seen during briefings in Starcraft: Remastered. By default, however, this is disabled. Added a variety of new AI scripts in order to enhance gameplay against the computer during single-player campaigns. AI will send attack waves at you with random amounts of enemy units and certain combinations of enemy units are also randomized. These have been scaled to difficulty whereby the randomness is greater in the enemies favor when the difficulty is set higher. Most missions repeated will have similar, but never identical, enemy waves against you! Duran (Ghost) - Stim Infusion (Increases movement/attack speeds by 50% and also heals. Dragoons and Shield Batteries will now use their SC2-LOTV model version by default. In order to revert to their more classic SC1 version, check the appropiate name tag in the SCMR Launcher menu under Options>Models. Raynor's default portrait has been updated to use a "shaven" portrait much like his SC1 version. Generally, he will appear in his non-marine ("Commander") version portrait. Raynor Vulture and Raynor Hyperion will now use this portrait, as he wouldn't be in a marine combat suit while on his Vulture or while on-board the Hyperion. When he is a marine in various missions and situations, his portrait will still reflect his marine outfit. Added a new "cheat" command called "Remix" that will play a secret remastered Terran soundtrack if within the Terran campaign. If within the Zerg or Protoss campaigns, will instead play unique Zerg and Protoss soundtracks respectively. In addition, the following commands will play a secret track for the particular race you are playing: Terran - "lost viking". Zerg - "radio free zerg". Protoss "for aiur". After any secret track is complete, regular music will resume. If the user types in the same command again, it will end the track early. Added all original SC1 cheat commands, such as "The Gathering". Re-typing in any cheat command will revert that cheat. A full list of accepted cheat-codes in SCMR can be found on SC2Mapster on the SCMR page. There is an additional visual effect for Plague when cast upon enemies ontop of the classic red "goo". Units will have flies swarm around them in addition to zerg-like vines attached to them. There is now loading music per map launch, each one different per map, tailored to the race/faction you are playing. Pump up the volume! Fixed the small/default briefing text issue. It now uses proper Terran/Zerg/Protoss', per respected campaign, unique colors and in larger size that is readable. (Editor) Created stand-alone actor entities for unique SCMR-Brood War units such as the Shuttle,Valkyrie, and Devourer. This change properly now reverts unused Starcraft 2 units back to their original selves, such as the Warp Prism,Viking, and Corruptor, respectively. This change assists with other custom campaigns using the SCMR mod that may still wish to utilize those SC2 units. On mission defeat, you will now be taken to the proper classic Brood War "Defeat!" screen. From here, you can restart the mission, quit, or load a save. Briefing portraits without talking mouth animations now properly move their head indicating they are talking rather than staying still. Added three new "Sound" check boxes to Gameplay. These are Buildings, Weapons, and Abilities, under a header called Classic Sounds. Each option allows the player to convert all sounds to their classic Starcraft versions, or leave defaulted to Starcraft 2's versions, respectively. By default, all three are checked. Added weather effects to be enabled to missions if desired. By default is disabled. Other "standard" factions do not have unique models which include: Dominion, Raynor's Raiders, Kerrigan's Zerg, Tassadar's Expedition Force. Updated/corrected a few missing options/bugs in the Audio toggle feature for Unit Voice-overs. Missing voice over swaps were not being applied to some of the options selected. 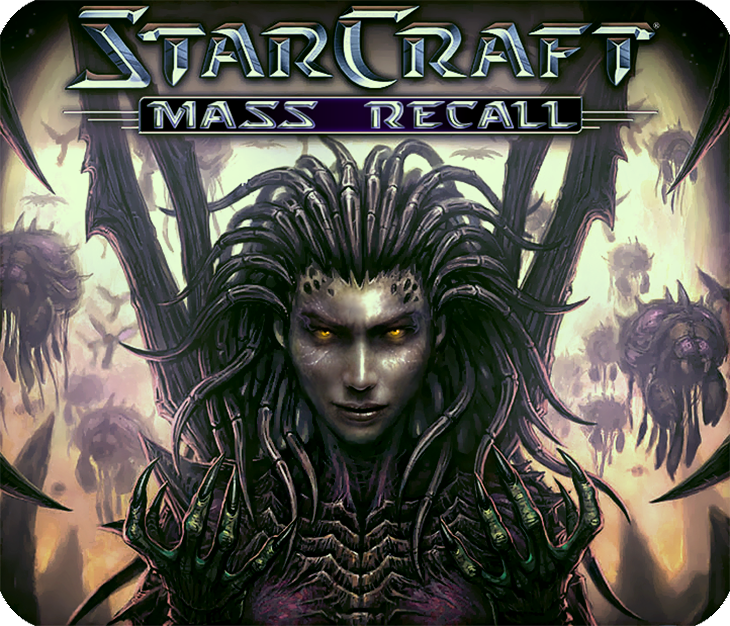 Also added "Infested Terran" and "Cerebrate" to the list of audio swaps, whereby Infested Terrans retain their SC2 versions if not selected, and the Zerg Advisor defaults to the Infested Queen voice, unless selected to the Cerebrate. By default, all of these voices are checked to be used. Furthermore, various units that had issues swapping between SC2 and BW sounds when checked have been fixed. Via the "Extra Hero Appearances" option in the Evolution pit section, players can choose to have heroes playable in missions they otherwise didn't appear in. In some missions, having this active will enable a never-before playable hero appear as well. Be warned however: enabling this will append the extra objective of keeping the additional hero alive throughout the mission! Added a special FMV at victory. This is the cinematic dictating these events from Starcraft 2. This is ONLY activated in Terran9b on victory. Terran9a remains unchanged for its victory. Added a firing animation to the Ion Cannon in Terran10. Has absolutely no offensive capabilities towards you and is purely cosmetic for the purposes of showing the Ion Cannon firing on escaping vessels from Tarsonis. Added a slight cosmetic change to improve the story near the end beacon. When you bring the chrysalis to the beacon a Zerg transport tentacle latches onto your area and the drone carrying the chrysalis hops aboard. Then, Daggoth will make his comment about to prepare yourself for warp travel. This makes a bit more cohesive sense that you need to board an actual Zerg transport capable of breaching through space than simply launching a drone from the middle of a space platform! If "Extra Hero Appearances" is enabled, the added objective of bringing Raynor, alongside the standard Tassadar and 2 Zealots to the beacon, is appended. In addition, Infested Kerrigan will make an appearance and attack you when near the beacon entrance. She cannot be killed and when weakened will burrow away. Some custom dialog has been added to this scenario. If "Extra Hero Appearances" is enabled, there is a new surprise waiting for you just before you attempt to open the final door to Zeratul. You will have to defeat Infested Kerrigan again. Similarly to Protoss05, she cannot be killed, but will retreat when weakened. Custom dialog has been added to this scenario.